Inspired by the rather comic misrepresentation of the Crypts and Things game I’m running at Furnace Con in October , whose description on the draft games time table read – “What starts as a simple enquiry into an sub-standard pot of tea becomes first a murder investigation and then something yet more frightening” (garbled with the British Pulp heroes game in the line above ), I imagined the following genteel scene in a Melnibonean Torture Garden…..
……The gentle clash of steel ensues. OK I’m thinking about doing away with the Max no of Languages column against Intelligence, and instead replacing it with a percentage called “Chance to understand other language”. Rather than the player picking from a long list of languages, with the max number being set by their Intelligence, every time they come across a language other than their mother tongue they roll against this percentage. I fell this would simplify play, make INT a bit more useful, and be in keeping with Crypts and Things setting Zarth which as an ancient dying world many millenia old has many dead or near dead languages of empires/cultures long gone to dust. But I’m interested in your views. But enough of my wittering….here’s the full announcement from Ken. 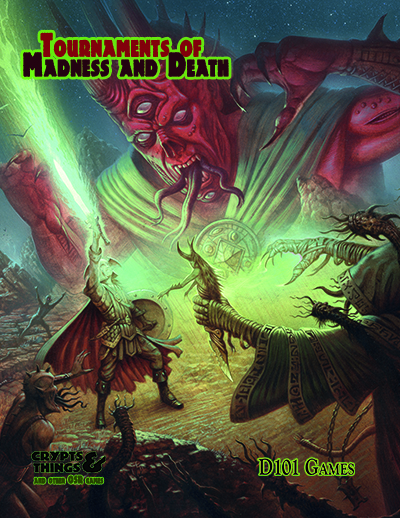 First launched to critical acclaim as a series of supplements for RuneQuest II (“The best British fantasy setting since WFRP 1st edition” said Newt Newport), Clockwork & Chivalry now returns in a standalone 2nd edition featuring the new Renaissance rules, a D100 open gaming system based on OpenQuest and compatible with 1st edition supplements. Fast, brutal, and geared up to a world of black-powder weapons and political machinations, the new rules will also be the bedrock of a series of fantasy and historical RPGs forthcoming from Cakebread & Walton: Purveyors of Fine Imaginings. Alchemists, diggers, dragons, engineers, mercenaries, puritans, ranters, royalists, satanists, thieves, witches, zombies… which side are you on? As many of you probably know, Mongoose Publishing will cease to support the RuneQuest II license in the autumn, and this has left us with a big decision to make regarding the future of Clockwork & Chivalry. Giving up on the line was never an option – we were determined to finish the Kingdom & Commonwealth Campaign, and have other ideas we want to develop for the game world. At the same time, we value our autonomy as a small independent games company. The new Renaissance system will be based on OpenQuest and Mongoose RuneQuest I, and will aim to be as compatible as possible with existing C&C supplements. At the same time, this rule-set, stripped of the C&C background but incorporating some of the rules (such as Righteousness Points and Factions) will be released under an Open Gaming License as a free download. The rules will be aimed squarely at role-playing in the age of black powder weapons. The creation of Renaissance will give Cakebread & Walton a solid rules set for the development of further games in the future, as well as allowing others to use it in their own games under the terms of the OGL. Once Clockwork & Chivalry 2nd Edition is released, we’ll be re-issuing the first 4 parts of the Kingdom & Commonwealth campaign with minor tweaks to fit the new rules, and then the last two books in the campaign, Hobbes: Leviathan and London Calling. We’ll also release a small conversion document so that those playing C&C with the existing RuneQuest II Core Rulebook need not change rules to finish the campaign. 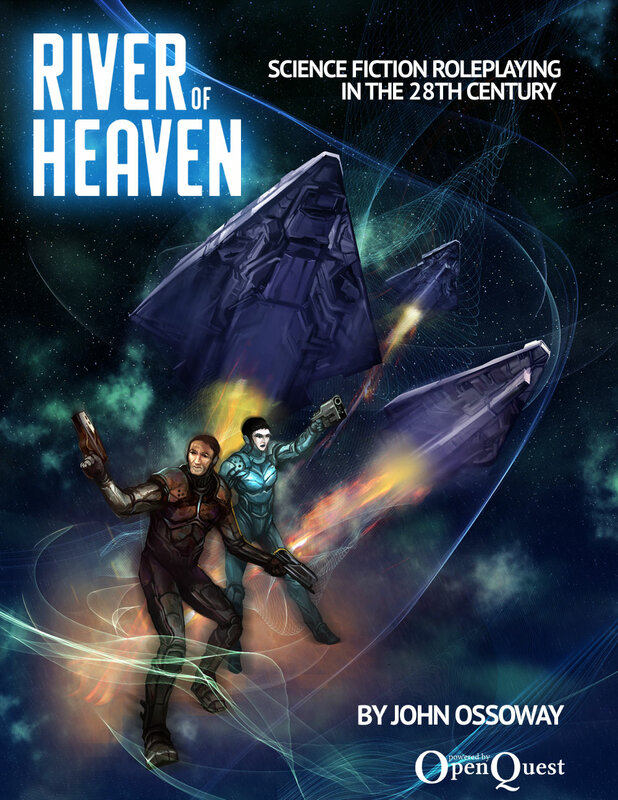 Taking some time out from the usual fantasy fare here at D101 HQ, me and John Ossoway (my co-author for Savage North and the man behind the awesome Cthulhu Rising) have been hitting warp speed to get his OpenQuest powered hard Sci-fi game, River of Heaven, done by eary November (in time for a Dragonmeet release). Big Bad Con is a con in the Bay Area , San Fransisco 7-9th October. Experience Required: None (OpenQuest is a BRP-derived fantasy game; the basics of the system can be taught quickly). Characters Provided: Provided: Yes, with room for customization. The Thane’s son lies struck with fever and madness. The village healer says the only cure for the ailment ccan be found in the Dreadwall Forest: a place of hauntings and legend. You’ve been warned away from the Dreadwall forest since you were a child, but now must brave the dark boughs. Can you find what the child needs, or will you succumb to the terrors of the Dreadwall?